And so our introduction to Roman history, in the version suitable for a 4-year-old, begins. We went to the Roman forum with the kids when they were respectively 4 and a little over 2 years of age. We had left our house without a specific plan to visit the forum, but when we found ourselves in front of the forum entrance, no queue ahead of us, we decided to make the most of the moment and went it. It turned out to be a real fun afternoon and the place sparked in Mr M such an interest in history it surpassed my most optimistic expectations. Visiting the Roman forum with kids stayed as a highlight of our trip. Accessibility: is the Roman forum buggy friendly? 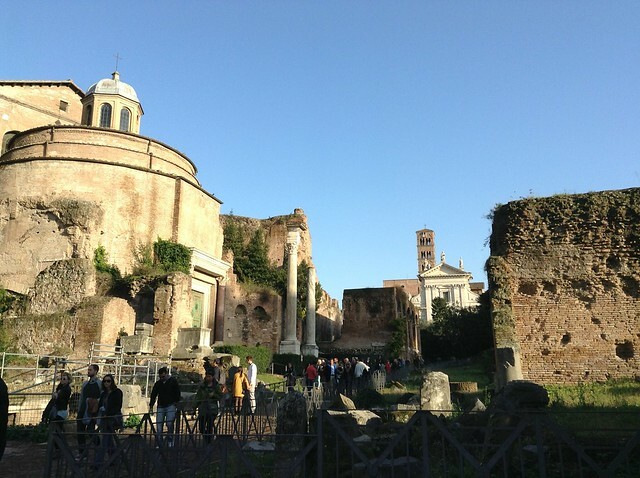 Guided vs self-guided: is a guided tour of the Roman forum worth it? 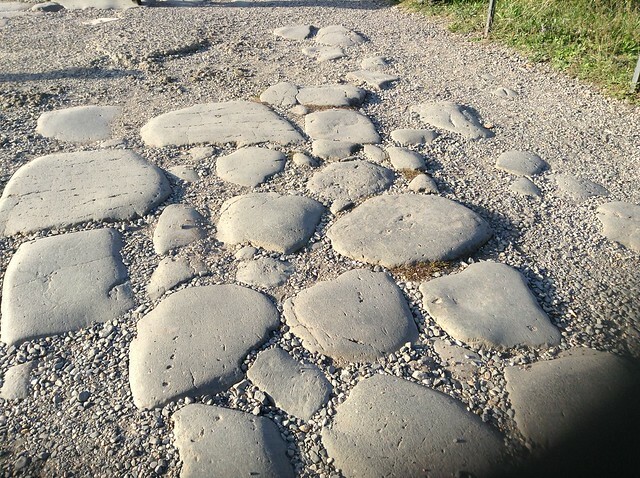 Prefer a sling or a baby carrier to buggies: ancient Roman roads are bumpy! Consider a combined tour of forum and colosseum but unless you pick one specifically for families, opt for two different visits if you have young children as the sites are big and are likely to make them tired. Check out this interactive tour for families and also this Colosseum and ancient Rome tour specific for families with kids. 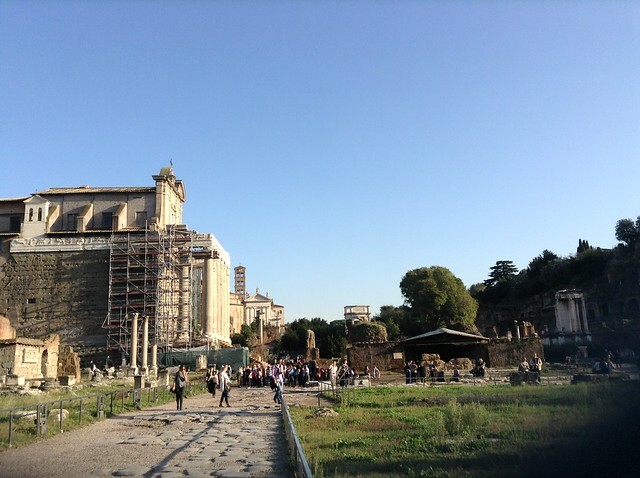 The forum is an open air archaeological site sitting that sits between the Palatine and the Capitol hill, two of the 7 hills Rome is built upon. The excavation lies a bit lower than the current street level and this characteristic means that it gets battered by the relentless Roman sun: at lunchtime or in the height of the summer it becomes a true furnace, with no water or any shade to provide relief! In spring and fall, almost any time of day is good to visit, while in summer it is important to avoid the hottest hours of the day: early mornings are the best option, especially if you are also visiting the inside of the Colosseum: the visit of the two will take a few hours so it’s important not to be there in a rush (depending on the season, it closes as early as 4.30 pm). We went to the forum on a sunny November afternoon, right after lunch, and it was a perfect time. The forum has a ramp for buggies and wheelchairs and I believe part of it even has an elevator to help with mobility. I saw the ramp (the elevator I only read about) but to be honest with you if you can avoid going in with a buggy, your life would be a lot easier. The streets are cobbled and pushing a buggy is a real nightmare for both the one pushing and the one pushed: it’s a really bumpy ride and tempers are guaranteed to flare! If you have a baby, the best way is a sling or some form of carrier. If you have a toddler, my suggestion is to try and go there when they are full of energy and willing to run around: they should not climb on the ruins, so some supervision will be needed, but there is plenty of space for them to move about safely and a lot of little things to discover (plants, coins melted in the pavements etc). Comfortable shoes. A must have in Rome and a crucial piece of equipment if you are visiting this archaeological area! Steps, dusty paths and ancient roads are not kind to high heels and flip flops: comfortable sandals with straps of runner are the best choice of footwear for both adults and children. Water and food. Bring a bottle of water and something to eat if you think you might spend a lot of time there. The forum does not have a dedicated cafe’ or refreshments area and in the spring of 2016 the previously ubiquitous vans selling overpriced sandwiches and snacks along via dei fori imperiali have been banned, so it is important to be prepared. You can bring food from home or you can get supplies in the cafe’ near metro station ‘colosseo’, just in front of the forum and accessible from the street. If you have more time, stretch to the little roads to the side of the Colosseum (exiting the metro station, go left) or, even better, climbing the hill just above the station and walk a couple of minutes towards piazza San Pietro in Vincoli: despite the proximity to the colosseum, all it takes is to turn a corner to get better choices and lower prices! Books. The Roman forum is stunning but there is not much for kids to do, as such. One thing that we found really great to bring was a little book about ancient Rome for the kids, of the kind with pictures of how Rome was and what it is like now. A lot of street vendors have them along via del fori imperiali and the kids loved the past time: the one we got is a small booklet with a picture of the forum as it is now and a transparent page that overlaps with the first one showing how it was when the building was standing and before the decorations were stolen or re-purposed.The kids were astounded and it meant we could visit the forum for a long longer than we thought possible with little legs in tow! This is a very personal choice depending, among other things, on how familiar you are with roman history, the age of your children and what you want to get out of our visit. The forum is not equipped with explanatory panels and this makes it impossible for the non-expert to understand what the different buildings were and what they represented. If you are happy to simply take a stroll in beautiful surroundings (and believe me, the forum is beautiful!) then a self-guided tour with the aid of a good guidebook is probably sufficient to give you an idea of the area. If you wish to learn more about what you are seeing, then a guided tour is the best choice: many tours are available (many can be booked online) and some cater specifically for families with children: as mentioned above, we loved the tour by Rome Tours for kids, that managed to capture the attention of little ones. If you wish to learn more about what you are seeing, then a guided tour is the best choice: many tours are available (many can be booked online) and some cater specifically for families with children: as mentioned above, we loved the tour by Rome Tours for kids, that managed to capture the attention of little ones. 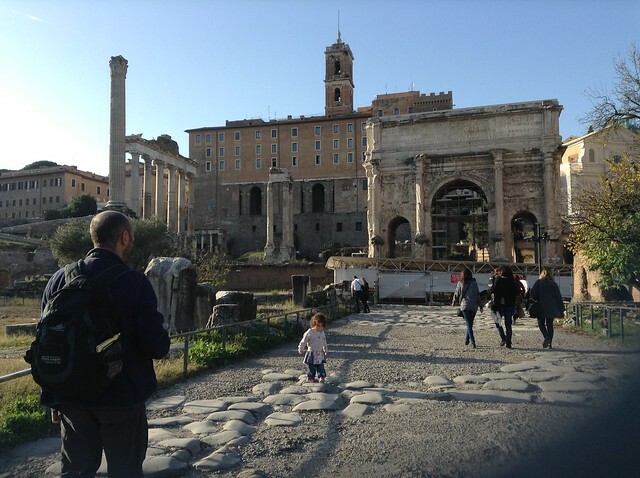 Have you been to the roman forum with children? I’d love to hear about your experience and if you have any tips to add!